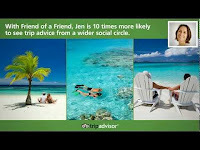 TripAdvisor has launched its “Friend of a Friend” feature that highlights trusted reviews and opinions from friends of Facebook friends. Representing the next step in making travel planning more social for the TripAdvisor global community, travelers are now ten times more likely to see personalized travel advice on TripAdvisor. Every day, Facebook-connected people write one out of four reviews submitted on TripAdvisor. Each of these travelers has an average of 190 people in their friend network1. With access to friends of friends, the average network can soar to tens of thousands, making social travel planning exponentially more useful. When researching a hotel, restaurant, or attraction, people will see their friends’ reviews first, followed by reviews of their friends’ friends. They can use the TripAdvisor private message service to ask anyone in this network for further advice. As always, reviews from the greater TripAdvisor community will also be displayed below friends’ reviews so travelers can continue to benefit from the wisdom of the crowds. Travelers can adjust their privacy settings within their Account Settings on Facebook to limit what their Facebook friends can see on TripAdvisor. Travelers who do not want access to their friends’ travel advice, or don’t want their friends to see their own reviews, can opt out. 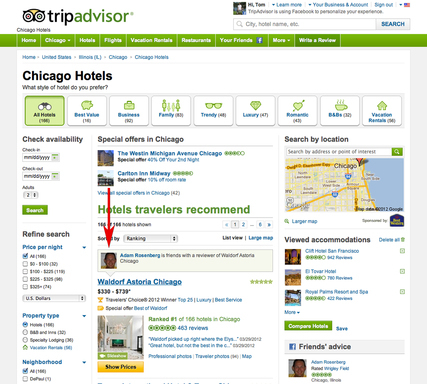 The “Friend of a Friend” feature is now available on TripAdvisor sites worldwide with the exception of China and Egypt. 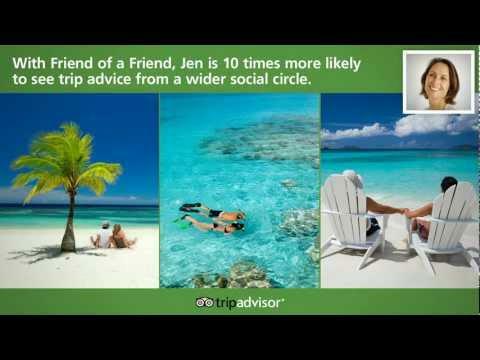 To experience Friend of a Friend, please log in to Facebook via www.tripadvisor.com.